Having just finished this today I realise it's taken me 11 months to get through. Partly due to getting distracted by other books but mostly because it's split up into three sections and it became too easy to finish a part and then set it down. 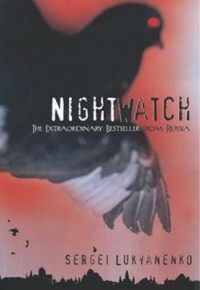 The book itself centres around Anton, a light one, who is part of the Night Watch, others who 'police' the dark element of the supernatural world. The war between the two factions has been raging for centuries and each side is always looking to tip the balance in their favour. I liked Anton for the most part, a wheel in the cog of something much bigger who tries to do the right thing but seems to miss the mark on this most of the time. There were lots of other characters and background was given on some of them but you never felt you really knew them that well. It didn't help that the book feels a little disjointed, each part was a complete story but also continuing story/themes from the last part. This made it too easy to put it down and not itch to get back to it. I thought the world building was interesting and well done with a massive scope for adding a lot more into it, as this is the first book in 4/5 I would be looking forward into finding out more about the history of the watch and how the agencies run.